Surge protector doubles as an iPad desktop stand/holder for thorough protection of your personal electronics. 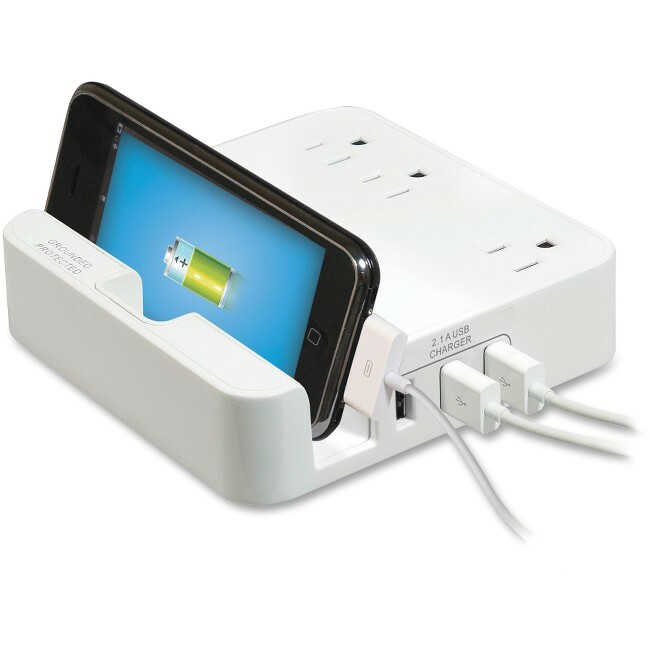 The combination of USB charger ports and AC outlets provide instant power access for all your gadgets. Play and charge your iPad hands-free on the specially designed iPad stand. With the X3 Metal Oxide Varistor technology, the patented, high-temperature isolation casing is capable of preventing fire during an abnormal surge condition as a result of arcing. Design offers three, total 2.1 amp/DC 5V USB outlets as well as three, AC 1080 Joule-rated outlets along the top for easy access. Personal power station also includes a light indicator, 15 amp circuit breaker, 120VAC, 60Hz frequency, 1800 watts, 500V UL clamping and a 6' three-prong power cord with a normal SJT cable. Casing is made of ABS fire-retardant plastic. UL listed. cUL approved.